Derrick Rose is Back and ready to play!!! 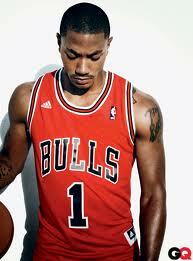 Derrick Rose Looking Good This Year!!! Well hopefully KD is right because D.Rose we miss you and we’re hoping for a dope return!!! D.Rose was out all of the 2012-2013 season do to the torn ACL in his left knee. D.Rose suffered the injury while trying to leap off his left foot in the lane with 1:22 left in playoff game on 04/28/12 against the Philadelphia 76ers. D.Rose is back and ready to play!!! Click here to check out the full story!! D. Rose is coming Back and that’s a WELL known FACT!! Simeon Wolverine! Let’s GO! !